The B2G is the most affordable, high quality Smart Braille display on the market! 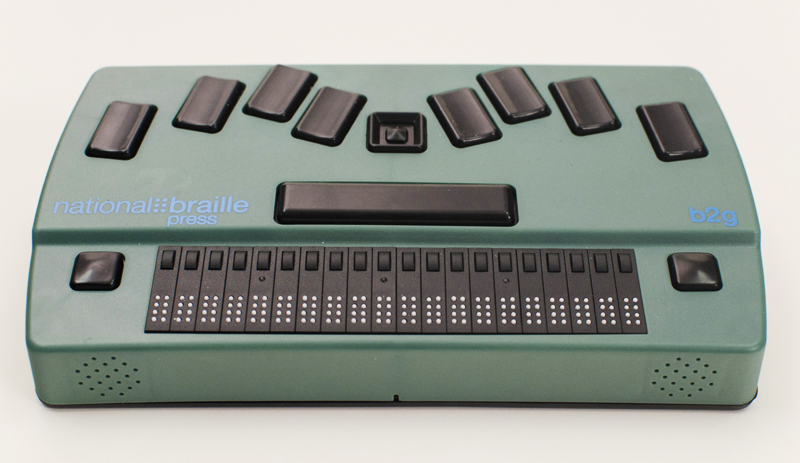 The B2G is a portable, Android-based refreshable braille computer, designed specifically for blind people. Get the processing power, resources and versatility you need to be connected and integrated into today's digital world. The B2G can now Bluetooth with the iPhone, and can be a braille terminal for your computer. It gives you the flexibility to add or remove apps, and to tailor your device the way that you want. Read the complete description of the B2G here. Also see the B2G FAQ. If you wish, a monthly payment plan is also available through PayPal. Through the PayPal financing, if you pay within six months, there is no interest charged. Longer-term plans are also available, but interest applies. Click the link below, and be sure to select the "PayPal Credit Special Offer" tab! - USB -standard USB 2.0 for connectivity and peripherals such as a QWERTY keyboard or mouse, micro USB for charging. Return Policy: A full refund for your device can be obtained within 30 days from the shipping date for the product, providing that the unit is returned undamaged, in new condition and returned with all materials in its original packaging box. See below for shipping instructions. Instructions for Return or Repairs: You are the owner of your device and responsible for shipping it to NBP for return or repair. NBP is not responsible for damages or the loss of a unit by any carrier. It is recommended that the owner insures the package for loss or any additional damages that could occur in shipment beyond what was described in a repair.